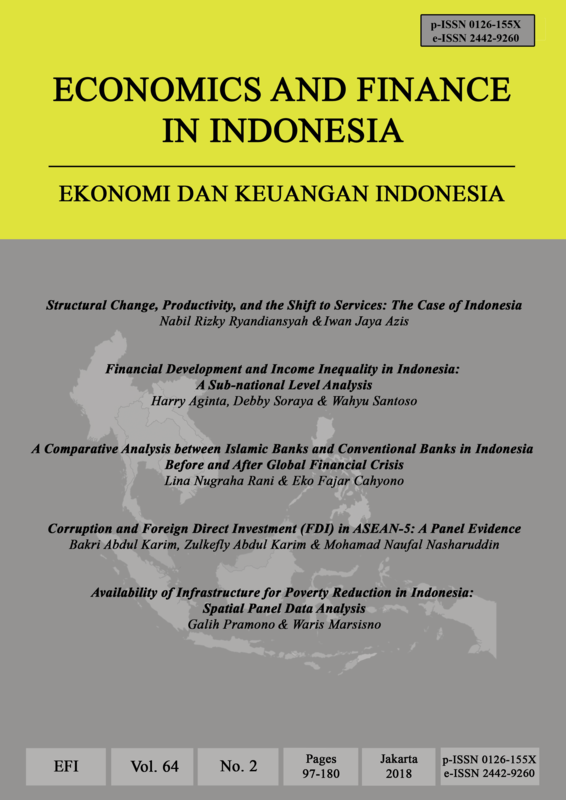 Economics and Finance in Indonesia (EFI) publishes quality research papers on the Indonesian economy. All articles are written in English and selected through double-blind peer review process. EFI is accredited by the Ministry of Research, Technology, and Higher Education (Kementerian Riset, Teknologi, dan Perguruan Tinggi) SK No. 21/E/KPT/2018 dated July 9, 2018 as a Sinta 2 journal (equivalent to international journal) and published with financial support from the Institute for Economic and Social Research, Faculty of Economics and Business, Universitas Indonesia (LPEM FEBUI). Neither the Institute nor the University takes responsibility for the views expressed by the authors. EFI was originally launched in 1948 as “Maandblad voor Financien“ before being renamed into “Economics and Finance in Indonesia – Ekonomi dan Keuangan Indonesia (EKI)”.This transformation signifies a reorientation of the journal's focus to better communicate the research findings of Indonesia economists to a wider international economic readership. Today, EFI is aspiring to be a forum for a fruitful academic exchange between Indonesian economists and their overseas colleagues. The new editorial board members have decided to change the publication period of the EFI Journal from three-time per year to two-time per year. Therefore in 2017, Vol. 63, the EFI Journal has two numbers of Issue 1 in June and Issue 2 in December. EFI charges no fee to authors for publication of articles.